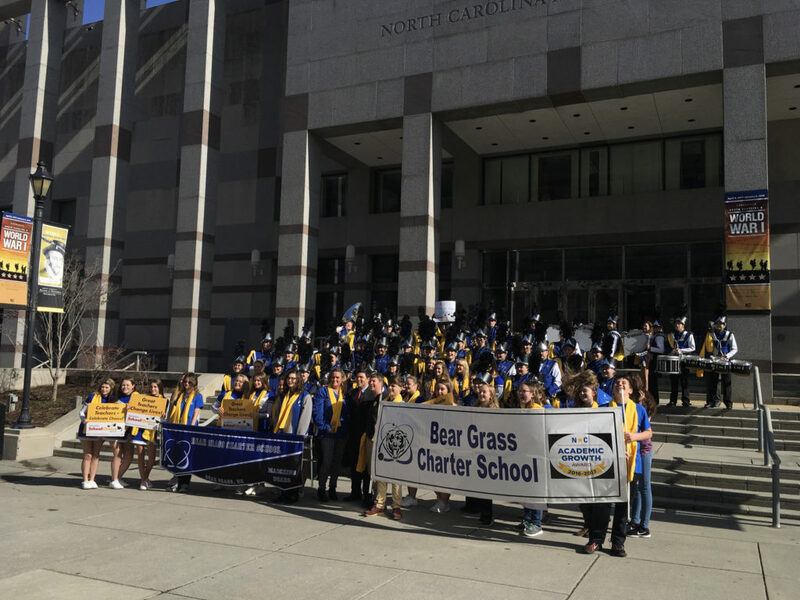 At the heart of Tuesday’s school choice rally, organized by the North Carolina Association for Public Charter Schools, was a celebration of student achievement through educational opportunity. School choice supporters, decked out with yellow scarves and armed with school choice posters, filled the N.C. Museum of History auditorium to celebrate National School Choice Week. Parents, teachers, and education leaders gathered for the rally and gave their support to student performers. The Bear Grass Charter School band performed the national anthem and a few pop songs, while cheerleaders from BGCS and Research Triangle High School performed the 2018 National School Choice Week dance. The rally even featured a military drill performed by young students from Torchlight Academy. Moaad Al Wakil, a senior at RTHS, gave a speech about leaving his comfort zone and becoming the captain of his school’s debate team. Leticia Tusset said she once was incredibly timid but because of RTHS she was able to perform a Shakespearean monologue before a crowd. While student achievement was a main focus of the rally, personalized education also was addressed. “Giving students and their families a choice in their school is the first step toward that vision of personalization,” Brown said. Over the past few years, state legislators have made three new school choice programs available to families: the Personal Education Saving Accounts, Opportunity Scholarships, and Special Education Scholarship Grants for Children with Disabilities. They also lifted the statewide cap on public charter schools and allowed more growth in charter school enrollment. Families are turning to nontraditional schools in growing numbers. Last year, the Department of Public Instruction released data showing increased enrollment in charter, private, and homeschools. Public charter schools saw the greatest gains with 11,437 new students in 2017, making total enrollment 89,228 students. Sharon Scott, a BGCS teacher and also a parent, said she was proud of the students at the rally and the legislators who support the school choice movement. “School choice means everything to me,” Scott said.